Day three of my Space Coast Birding and Wildlife Festival adventure was squally, rainy and cold (at least by Florida standards). We had a good string of seasonably warm and sunny days leading up to the festival, and the weather basically held until the 23rd, when the wind began to pick up. But the next morning was a bit problematic for our trip to Lake Apopka. We had a few stops along the lake’s restoration areas, but remained huddled near the bus, as a windbreak. These areas were once farmland that the St. Johns River Water Management District purchased to undo years of harm agricultural runoff and other environmental hazards had done to the lake. As we were leaving the area of the pump house not far from Lust Road, the bus got stuck in some mud. We had been looking for a previously identified White-faced Ibis (unusual for central Florida), and had not been able to find it. As we waited for a person to come and use a nearby bulldozer to pull the bus out, we all scanned the grasses and willows again, and finally someone spotted it in their digiscope! It can be very hard to pick out a White-faced Ibis from a Glossy Ibis, especially in the winter, unless you can get a good look at its eye and lores. So it was fortunate we got stuck, otherwise we would have missed out on a rare bird. I wasn’t able to take much in the way of photographs due to the weather and bad timing, which is unfortunate. Despite the howling winds, we still managed to see (as a group) over 80 species of birds. We were hoping to see the Groove-billed Anis and Vermillion Flycatchers that have been wintering over at the lake, but the wind likely kept them grounded and out of sight. One of the few decent photographs I managed to take. 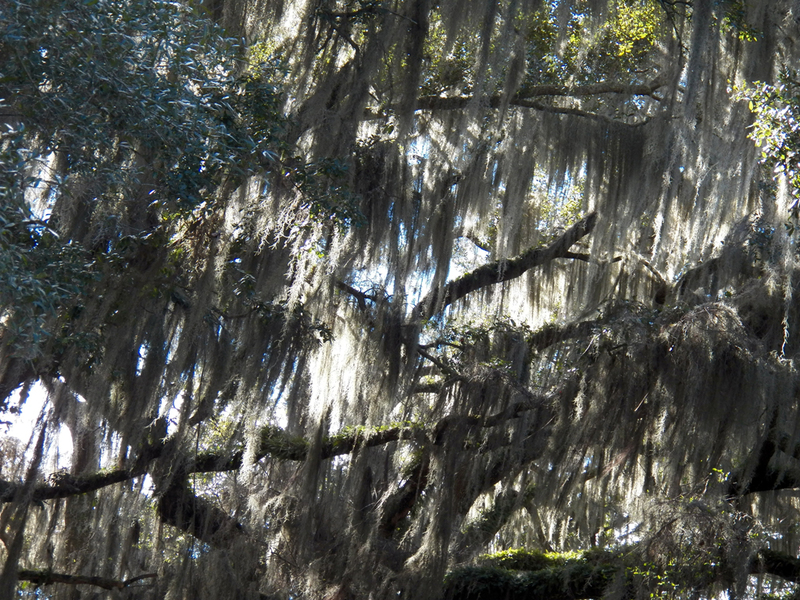 I sometimes forget how exotic all this Spanish Moss must look like to people wholly unfamiliar with it. It’s really quite dramatic and ubiquitous here in Florida. For me, personally, it was very gratifying to get my first verified Orange-crowned Warbler later in the day in a flooded area of young trees and brush near the North Shore Restoration Area. Again, not so good for photographs, but we netted a great bunch of birds anyway. After getting back to EFSC but before heading home, I once again tried to find the Long-tailed Duck near Parrish Park, but the winds were still really screaming (over 30mph) and there were very few birds out on the water. Posted on 2015 January 30 2015 January 30 by Lonely BirderPosted in BirdingTagged Lake Apopka, SCBWF, Space Coast Birding and Wildlife Festival.